Equipment > Nevada_gold_care | Arrow Games/Bazaar & Novelty - Helping you accomplish great things! 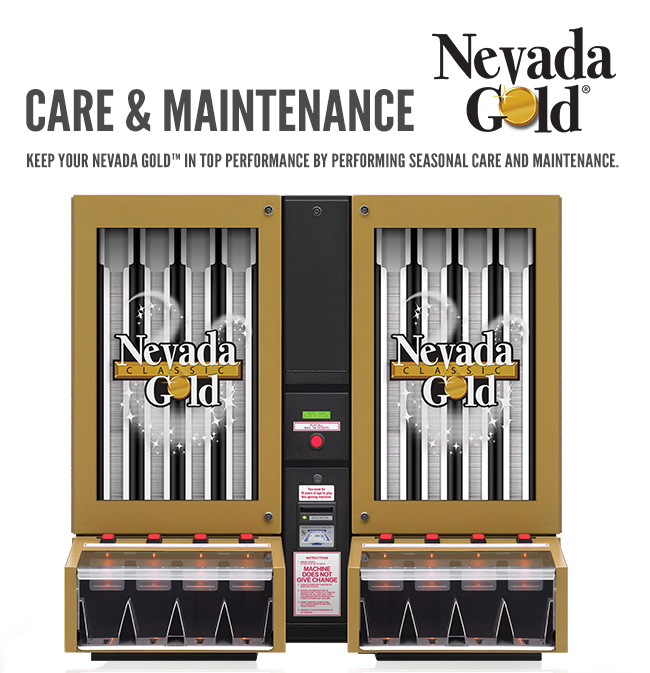 Keep your Nevada Gold™ in top performance by performing seasonal care and maintenance. Your model of the Nevada Gold Pull Tab Dispenser has been manufactured to exceed mechanical and electronic standards. The following information will assist you in the care and maintenance of your unit. Wipe the unit with a damp cloth and a drop of liquid fabric softener to keep it looking new. Do not use any abrasive cleaning materials or solvents to clean your model. Handle any removed parts gently and carefully. Dropping or mishandling parts can damage electronic components. Use plastic cleaning implements or a soft cloth to remove dust from inside the unit. Metal tools can damage electronic parts. Use light lubricants and precision oiling implements to lubricate the gears, shafts and the chute door. Use Compressed air duster to blow out any dust or lint. As seasons change, climate conditions within your establishment can have an effect on paper pull tabs. It is suggested that you make gate spacing adjustments part of your seasonal Nevada Gold care and maintenance schedule. The Nevada Gold™ Pull Tab Dispenser adjusts to accommodate tickets that vary in thickness. To make the adjustment, you require one 11/32 inch socket. Open the console door and the hopper door. With the column empty of tickets, turn the wheel so the groove on the back roller is not positioned directly under the gate. Insert the Column Gate Spacer Gauge into the column so that the Gauge is behind the gate and the bent tab is facing forward. Carefully turn the gear towards you so the bent tab of the Gauge rests under the gate and above the roller. Turn the gear back to release the Column Gate Spacer Gauge and lift it out.